Carmina Silaidos (neé Schaefer) holds a Master of Science (M.Sc.) in nutritional science. For her Ph.D. she is currently doing research on the preventive effects of blueberry polyphenols on mitochondrial dysfunction as key factor of brain aging and Alzheimer’s disease (AD). 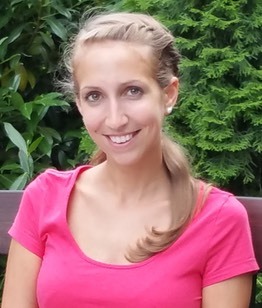 She contributes to a close cooperation with the clinic for general medicine (Prof. Johannes Pantel, Dr. Silke Matura) and the clinic for neuroradiology (Dr. Ulrich Pilatus), Clinics-Goethe-University Frankfurt that establishes mitochondrial function in isolated lympocyts using high performace respirometry, imaging of energy metabolites using P-MRT, and cognitive tests as a peripheral model of mitochondrial dysfunction in humans. Furhter, she establishes a cellular model mimicking the human blood brain barrier. "Geschlechts-und Altersspezifische Unterschiede der mitochondrialen Funktion in peripheren mononukleären Blutzellen (PBMC) und im Gehirn“ [Gender and aged specific differences of mitochondrial function in peripheral mononuclear blood cells (PBMC) and in the brain]. Healthy Aging Conference, March 16, 2017, Fulda, Germany.